Kopp Glass invites you to explore a new website created to streamline the optical design process in support of engineers and designers in the earliest stages of UV LED product development. Kopp Glass announces the launch of a new interactive website that enables users to develop UV LED products with increased power, greater design flexibility, and better cure quality. 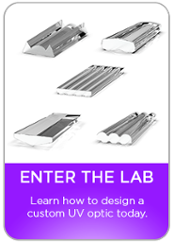 The UV LED Optic Design Lab is a platform for engineers to learn about and design molded UV glass optics to optimize the performance of their UV LED systems. Kopp developed this interactive tool to accelerate the new product development process. Optical design is critical to achieving maximum light output and efficiency. In some cases, optics can be used to reduce the number of LEDs required in a lighting system, while increasing the performance output. Due to the critical nature of optical elements, their design and impact should be considered early in the design process. Design Lab users are provided step-by-step guidance including valuable resources such as a comprehensive database of over 600 commercially available UV LEDs. This downloadable UV LED Product Guide is an essential starting point in the development of any new UV LED product. Unlike quartz, Kopp’s UV glass has unique material properties that enable it to be molded into complex and contoured shapes. Because of this flexibility, optical features can be molded into both the incident and exiting surfaces of the optic. This increases the ability, and allows flexibility to integrate molded UV glass optics into a design to control and improve light distribution. As a result, when a molded UV glass optic is paired with a UV LED array it can produce irradiance patterns that are narrow, wide, somewhere in between, or a unique shape. In other words, you now have the flexibility to design arrays and irradiance patterns to best meet your unique application and performance needs.